826LA is dedicated to supporting students ages six to eighteen with their creative and expository writing, and helping teachers inspire their students to write. 826LA offers a range of writing-based education programs, all free of charge, to more than 10,000 underserved youths each year. 826LA is part of a national network with chapters in eight cities. 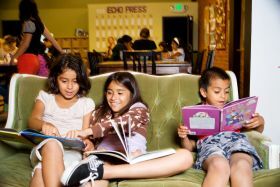 826 National was founded by author Dave Eggers and educator Ninive Calegari. With the help of over 3,000 trained volunteers, 826LA offers one-one-one tutoring and mentoring to underprivileged students who attend underperforming schools throughout Los Angeles County. 826LA's project-based approach challenges students to take ownership of their work. By demystifying the writing process, by making learning fun, and by creating gorgeous books and newspapers that honor their hard work, 826LA inspires young people to gain crucial skills and to express their ideas effectively, creatively, and with confidence. The organization targets underserved students, particularly ones for whom arts programs are not readily available. Its programs are steeped in the idea that the arts help students learn, grow, and engage with the world. All of 826LA's creative writing programs are free to all students, making them available to families who would otherwise struggle to afford creative programming and personal attention for their children. 826LA's instructional approach is rooted in project-based learning, an educational method that inspires creativity and develops confidence. At project-based learning's core is the belief that students are more engaged and retain more information when their learning focues on executing a project. Whether they come to 826LA for a field trip or a five-week long summer camp, students leave with a completed project: a storybook, a poety anthology, or a cd of just written and recorded songs. As one teacher asserts, "this kind of tangible result is very effective in encourging students to write and to develop confidence in their ability to do so." 826LA assesses its impact through the number of students it serves (over 10,000 a year!) and evaluations and surveys which demonstrate the growing confidence and skills of its students. Visit 826LA in Echo Park or in Mar Vista by entering through the Time Travel Mart, the whimsical gateway to the organization's programs. The Time Travel Mart offers supplies for weary time travelers, including robot parts and caveman favorites like mammoth meat. The store also sells copies of its student publications, and all proceeds directly benefit the organization's programs.